In Chemistry, ‘-ose’ at the end of a chemical term generally refers to a sugar compound. Hence, both aldoses and ketoses are groups of chemical compounds that are sugars; to be very precise, they are ‘monosaccharides’. Sugars can be made of single repetitive units or multiple units. The sugars made from single repetitive units are called monosaccharides and likewise if it is made from two subunits it is known as ‘disaccharides’. Therefore, aldoses are monosaccharides containing aldehyde groups at the end of the carbon chain whereas Ketoses are monosaccharides containing ketone groups in the carbon chain. 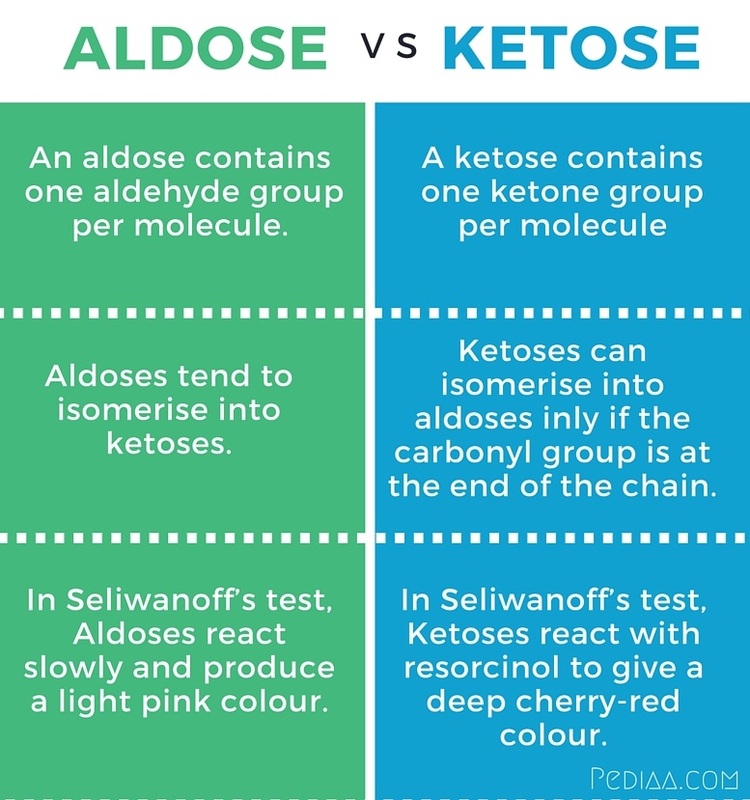 This is the main difference between aldose and ketose. In general, both aldoses and ketoses can be called monosaccharides. 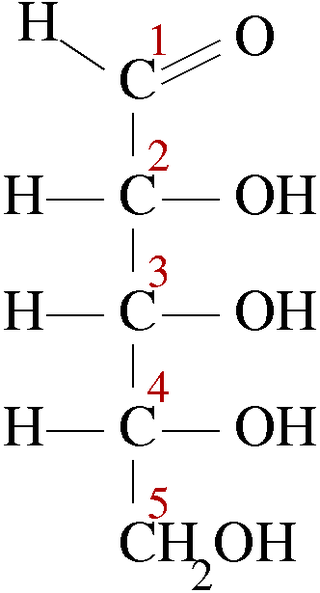 This is a type of monosaccharide that contains an aldehyde group on its carbon skeleton. Generally, there is one aldehyde group per each monosaccharide molecule. The aldehyde group is a reactive chemical group denoted as (-CH=O). The simplest form of aldose would be a sugar molecule with two carbon atoms, one containing the aldehyde group. The chemical formula of aldose is written as Cn(H2O)n.
Aldoses usually contain asymmetric Carbon centres (where four different types of systems are bonded to the Carbon centre under consideration). Therefore, an aldose which has at least three Carbon atoms is considered to have one stereogenic centre which exhibits optical activity. In addition, aldoses can be divided into two groups namely; D-aldose and L-aldose, according to the nature of their chiral activity. When the structure of an aldose is drawn in an open form, it called its ‘Fischer Projection’. When labelling an aldose either as D or L, we look at the chirality of the second furthest Carbon atom from the position of the aldehyde group. If the alcohol group (-OH) is on the right-hand side of the Fischer projection, it is categorised as a D-aldose and of the alcohol group is on the left side of the Fischer projection it is categorised as L-aldose. In general, biological receptors are more sensitive towards D-aldoses over L-aldoses. Aldoses can be differentiated from Ketoses through the Seliwanoff’s test. Aldoses react slowly to produce a light pink colour. Glucose, galactose and ribose are some commonly known aldoses. Ketose is a type of monosaccharide where the carbon skeleton contains a ketone group. Generally, there would be one ketone group per one sugar molecule. The ketone group is a reactive chemical group denoted as (-C=O). The simplest form of ketose is the sugar molecule made up of three Carbon atoms, the middle on with the ketone group. Just as aldoses, ketoses also have many stereogenic centres within the Carbon chain. Ketoses are also commonly drawn in their Fischer projection. Ketoses can be differentiated from aldoses through the Seliwanoff’s test. Here, the ketose reacts with resorcinol to give a deep cherry-red colour. Fructose, ribulose and erythrulose are some commonly known ketoses. Aldoses are monosaccharides that contain an aldehyde group per molecule. Ketoses are monosaccharides that contain a ketone group per molecule. Aldoses tend to isomerise into ketoses. Ketoses can isomerise into aldoses inly if the carbonyl group is at the end of the chain. And they are known as ‘reducing sugars’. Aldoses react slowly and produce a light pink colour. Ketoses react with resorcinol to give a deep cherry-red colour.